New York City has a gorgeous skyline that makes great wall decorations for dorms. Scenic views are fantastic for dorm wall art and will brighten up your college dorm room. This is even more so if you don't really have a view outside of your college dorm room - or at least not the one that you want. Maybe you want to add the gorgeous New York City Skyline to your college wall decor, but you want something a little different. You want a unique view of New York City that isn't typically in dorm room decorations. Our New York Freedom Tower - Manhattan College Poster will give you exactly what you are looking for in wall decorations for dorms. You'll get some gorgeous unique scenic views while still having the New York City Skyline in your dorm essentials! 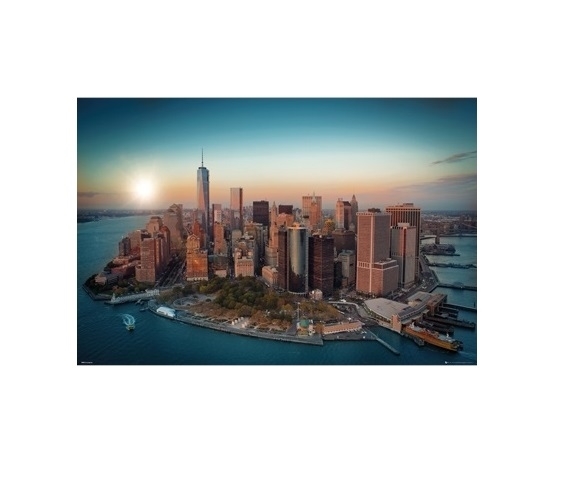 Our New York Freedom Tower - Manhattan Dorm Room Poster features a view that you don't see often when you see the skyline. This dorm necessities item features an overhead photograph of Manhattan for an amazing dorm wall art item. Surrounding Manhattan is beautiful aqua colored water. The color of the water matches the aqua color of the border of the sky that also has pink and purple tints for extra dorm room decor in your college dorm room. This cool poster for dorm rooms is absolutely stunning. This breathtaking dorm room poster will look amazing when centered over your dorm bed or even near your dorm window so you can have a gorgeous scenic view near your dorm window!